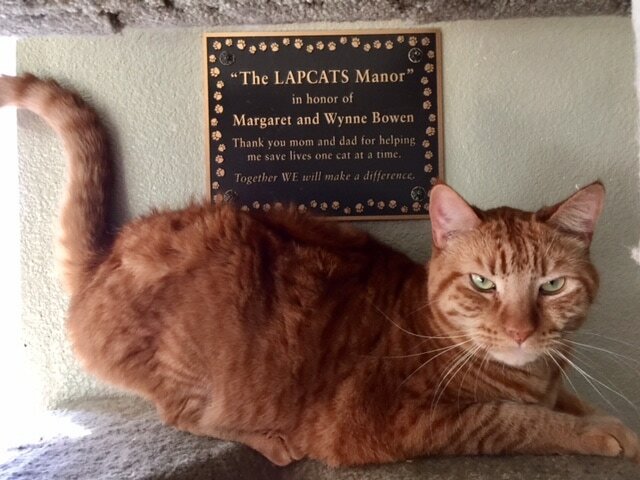 Lapcats was founded in April 2005 by Sacramento County Shelter volunteers Barbara Doty and Kim Dahl. When Barbara moved to Sacramento from San Diego (with a brief 7 year stay in Rio Rancho New Mexico), she was searching for a way to help animals and came upon the County Shelter by accident. A neighbor was looking to BUY a dog and Barbara suggested SAVING a dog by adopting from the local shelter. She started searching the web and found a dog that fit the criteria the neighbor was looking for and when she inquired about the dog, it just so happened he was a foster puppy with Sac County Animal Care. Barbara and the foster mom discussed the animal crisis in Sacramento and Barbara wanted to help so the foster suggested she visit the County Pound because it was in DIRE need of help. It took every ounce of courage for Barbara to step into a county pound without breaking down in tears. There were drop boxes outside the facility where people could dump their animals 24/7 with no guilt or recourse. The shelter was falling apart. Volunteers were scarce and the staff was disheartened-just going through the motions day by day of housing animals, adopting a few but having to euthanize the rest. The facility couldn't keep them healthy and couldn't house the number of animals coming through the doors. There was no vet. There was no money. It was awful. With 2 year old twins at home and another in elementary school, Barbara visited the shelter weekly both with the kids and without. She used her background in photography to shoot pictures of the animals, give them each a name (instead of a number), write a brief bio about them and try to work with area rescues to get them out alive. Sadly with the numbers coming in most of those animals she spent hours upon hours uploading to the web were destroyed. Their owners only had 3 days to find their lost pets and if they weren't claimed and weren't adopted quickly, there was no other alternative. She scheduled a meeting with the shelter director to ask what they did with cats who came down with URI (upper respiratory infection) the equivalent of the human cold. The answer was they were euthanized, destroyed, killed. Barbara asked why and the answer was shocking-"we don't have the money, time, or resources to treat them." There were simply too many animals coming in and not enough homes. People were not spaying and neutering and the shelter didn't have the resources to help them with that either. Barbara knew she had to do something and that's when she approached Kim Dahl who was the volunteer coordinator at the time. Together they were determined to help as many cats as humanly possible. When Barbara and Kim first started their efforts, there was no name for the organization, no mission statement, it was just 2 women fostering a few cats on their own and trying to adopt them into homes. In 2004, Petsmart was opening a new store in Elk Grove. Barbara and Kim approached the district manager and asked if they could work with Petsmart to house some of the County cats in the store but unfortunately, there was another group already in the store. Months later they received a phone call from that district manager asking to meet about forming a partnership with Petsmart. They wanted to have cats available for people to walk in and "adopt" or basically "buy." Barbara and Kim said NO WAY. They didn't want to "sell" animals and they wanted to be able to screen adopters. They also wanted to make the right match for each cat and each family which required being part of the process from start to finish. This was a new concept to Petsmart since historically their stores always allowed their associates to "adopt" the animals without any sort of protocol in place. But they wanted to give it try and let Barbara and Kim work their magic! 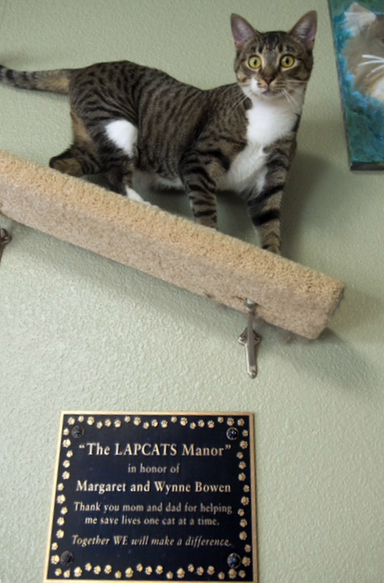 In April 2005 Lapcats solidified their venue and started a full partnership with Elk Grove Petsmart. They created their own volunteer base, foster program, fundraising efforts and community presence. There is a small but mighty dedicated team of volunteers working on different aspects of the organization like Grant Writing, Social Media, Adoption Counseling, Fostering, Fundraising, Humane Education, and Community Outreach. New volunteers are always encouraged and welcomed! Volunteers staff the Adoption Center 7 days a week and cats are rotated from foster care to the adoption center and back to foster if not adopted within a 2-3 week period. The partnership with Petsmart is amazing-they fully support our group and continually tell us we are a model program they are proud to support. They wish all their partners had as dedicated a group of volunteers as Lapcats does. In 9 years, Lapcats has adopted over 3,000 cats since January 1, 2016. Barbara and Kim saw a huge need for shelter cats. They were being overlooked and forgotten but not anymore. Now they get the extra time in foster care-as long as they need until they are adopted! They get extra exposure on the Lapcats website, at the Petsmart Adoption Center and on the Lapcats Rescue Facebook page. They get LOTS of extra TLC, and always get medical care if they need it and believe us, lots of them do! We do dentals, blood work, surgeries and provide special food to cats on special diets. We take in FIV+ cats, and those who may be blind, or deaf, or 3-legged. Lapcats focuses primarily on cats who are older, shy and frightened in the shelter environment or those whose owners have passed away or gone to nursing homes. All of these "symptoms" or "fails" in the eyes of the shelter are considered opportunities to save lives with Lapcats. Their ONLY HOPE at getting out alive is through fostering, rehabilitating and adopting. That's what Lapcats does!